Dimensions: 8.7" x 5.7" x 4.2"
Jewelry is one of those dorm accessories that you can't go to college without (and don't want to go without!) and is super hard to store. Especially at college. You don't have much dorm room storage space, which makes you wonder if you should even take your jewelry with you. With our Large Jewelry Box, you can still take your jewelry to college! It's conveniently sized where you can store it in any area you want to and any area you have free. It's a real dorm space saver! Store it on top of your dorm dresser, dorm desk, or on a shelf in your closet. And if you don't want it out when you're going out for the night, you can even easily store it in your dorm trunk. Our Large Jewelry Box has a black and silver design that will add to dorm room decor while being a reliable dorm organizer for your jewelry. Lift the lid of this dorm essential and you will find a mirror so you can actually see your ears as you put in your earrings and can tell if your necklace is facing the correct way. Along the middle of the large compartment are rolls for your rings or stud earrings and on each side of those ring rolls are sections for bracelets or large earrings. Under that large compartment is a small pull out drawer for more rings, bracelets, necklaces, or even small hair accessories! 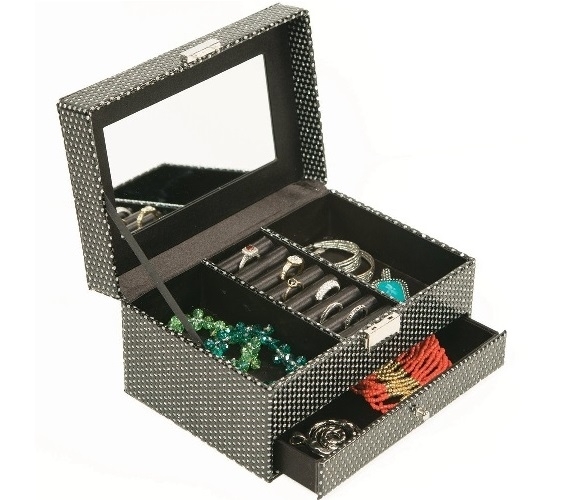 Don't let your jewelry become tangled at college - add our Large Jewelry Box to your college supplies!